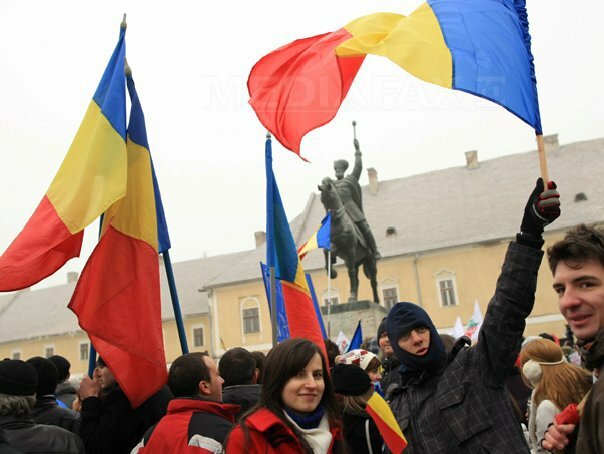 Well today is December 1, Romania’s National Day and one of the country’s biggest holidays. I currently am exiled from Romania and so it was a little bittersweet to watch everything on TV, seeing Traian Basescu stolidly enduring the snow one last final time before he steps off the political stage and leaves Romania’s future in the hands of younger men (and a few women). Poor old Romania, with its tragic holiday. In case you’ve never heard the story, a few brave men faced the bitter cold to gather in the small town of Alba Iulia on December 1, 1918 and proclaim the unification of the Kingdom of Romania with Transylvania and other majority-Romanian areas then under the jurisdiction of the Austro-Hungarian Empire. I salute the courage of those men but, sadly, their act wasn’t much more than wishful thinking. On December 2, Transylvania remained firmly under Hungarian control and it took a few weeks, in the days before television and national radio broadcasts, before most of their fellow Romanians even heard about the declaration. It was only two years later, when Americans and French diplomats were sitting around a table in a luxurious palace in Austria, that the foreign powers decided to “award” Romania with the new territories. Romania then squandered this gift 19 years later by foolishly agreeing to adhere to the Ribbentrop-Molotov pact, which resulted in half of Moldova being seized by the triumphant Soviet Union at the end of the war. The Iron Curtain fell, eastern Moldova (where I now live) became a Soviet Republic, the beautiful city of Cernauti became Ukrainian, and today as a wet snow fell on Basescu’s uncovered bald head, the country boldly proclaimed in 1918 will never be reconstituted ever again. Still though, that brave foolishness and fierce national pride is something that calls to my heart, which is why I chose Romania as my home. Every year, I always dedicated something to Romania on this date – my guidebook, my first book in the Romanian language or else I went on national television to celebrate the courage of my friends and neighbors, and to tell the entire country just how grateful I was to have a chance to live there. 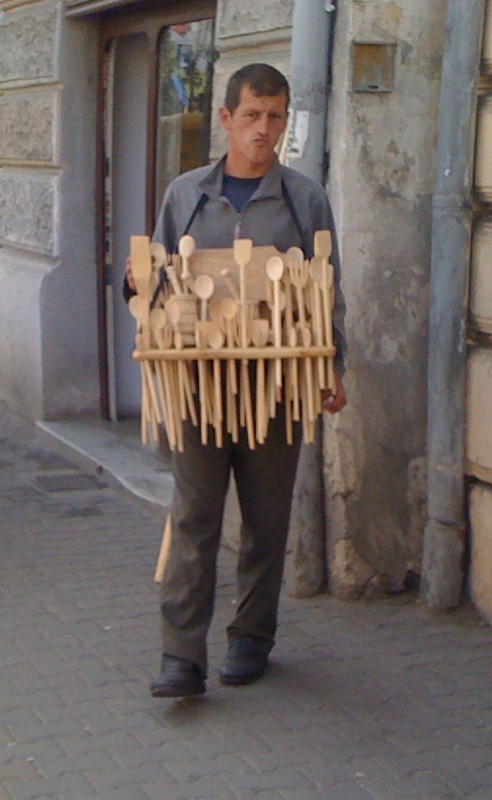 Sadly though, Romania didn’t love me quite as much as I loved it, which I guess is why they write country songs. In a bizarre and completely unfair judicial “process”, I was rapidly declared an enemy of the state. I was snatched off the streets like a dangerous terrorist and insulted and threatened with physical violence by so-called professional immigration officials, who considered it a job well done to dump me across the line into Hungarian territory this past July. And yet, as I stood there on that hot summer evening, watching the taillights of their car disappear into the land I am now legally barred from entering until 2017, I couldn’t help but smile. Whether 1918 or 2014, the borders between countries are just artificial creations in the minds of small men, and all the laws in the world could not keep Romanians in Transylvania from being Romanian, or me from being connected to the land of my heart, if not of my birth. Wherever you are, whoever you are, you are reading this post because you have (at least) a little love in your heart for Romania. From me to you, I raise a glass in the honor of that beautiful country, and one day I will return to brave the cold and the snow once more to celebrate December 1, modern Romania’s birthday. On this occaission,well said Sam. Just WOW. The assumption that Romania agreed to adhere to the R-M pact simply boggles the mind but to think that Romania received a “gift” in the first place is simply beyond reason. In all of our history, NO ONE made Romania any gifts. The negotiations for the territories where Romanians lived were real fights and Romania didn’t get more than 60% of what it asked for. This is why the border with Hungary is not today on the Tisa, this is why the border with Serbia is not 10km away from Belgrade and with the Timoc valley still being in Serbia rather than Romania. We couldn’t save hundreds of thousands of our countrymen, most of whom sent representatives to Alba Iulia, due to the “great powers” splitting “Transylvania” and the Banat mostly along majority ethnic lines. But a lot of Hungarians and enough Serbs got left behind in Romania too and there wasn’t any population transfer so we lost some and we got some more. But coming back to the negotiations, we fought tooth and nail for everything we got. Read your history dude, so far you’re way off the chart in so many ways. Well put Sam and God Bless Romania and all it’s beautiful people and beautiful country. Governments rise and fall but the people live on, endure and go on with life. Cheers! I hope that someday you’ll be back to Cluj. Say what? “Agreeing to adhere”? There was nothing to adhere to as the pact was secret at first.